Regent Road has changed much over the last century, from being a residential area to being a venue for all types of holiday shop, selling everything from Docwras and Potters Rock Shops, to Vettese's Ice Cream (probably the best ice cream in the area), and boxes of kippers, along with all the usual seaside requisites of buckets and spades, Pownalls Fishing Tackle Shop, and music CDs and cassettes to listen to. 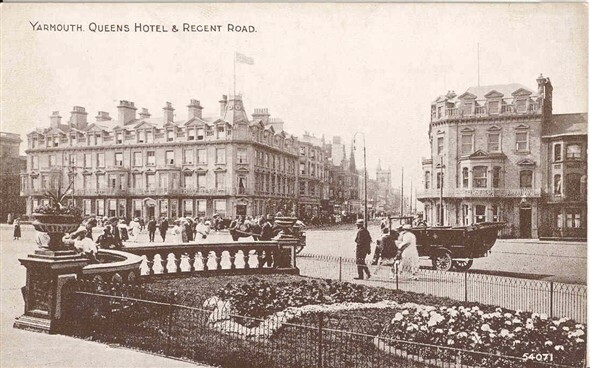 The first postcard shows the Seafront end of Regent Rd, which is now pedestrianised, as is the seafront area at its end. The second is hard to place, but would seem to be taken from the same spot as the second picture, but facing towards the seafront. The third is taken from the market place looking down towards the seafront. The fourth is of the Town end of Regent Rd, with the Regal Cinema on the right, and Woolworths old store on the left, which is now a KFC outlet. 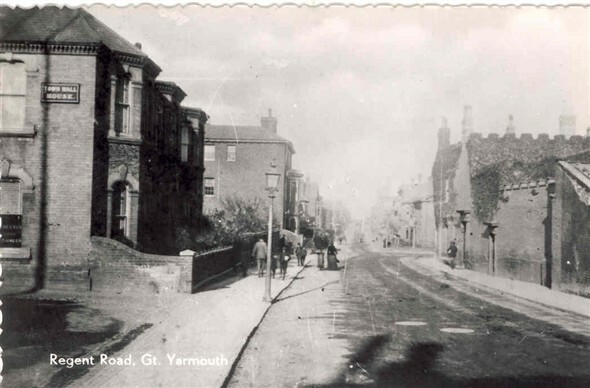 If a person was attempting to take the same shot today, he might well be knocked down by a motor vehicle, as the main road through Yarmouth now runs through the very spot! The fifth picture is of 76 Regent Road when it was a cafe owned by Percy Clements. This is an excellent site fantastic pictures. I have just spent a week in Gt Yarmouth and what really fascinated me apart from all the beautiful churches was a victorian house in Regent Road now used to house a wax works, does anyone know anything about the history of this beautiful property? 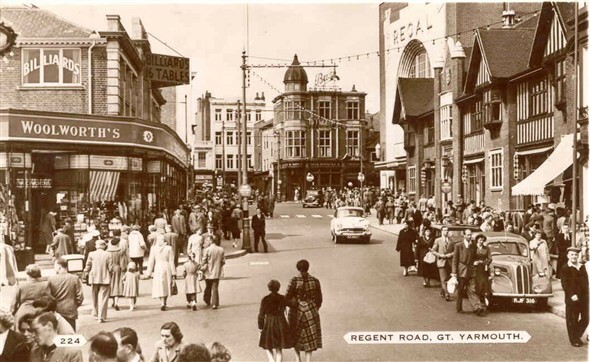 I come to Great Yarmouth every year and I love Regent Road! Looking back at the oldern times just shows me how much better it gets every year!!!! Can someone please tell me if there was a florists opposite the regal in the 1930's and if it was called Herberts? There is a story in my family that my great grandparents owned it. It is now an estate agents. Wow these photo's are amazing! 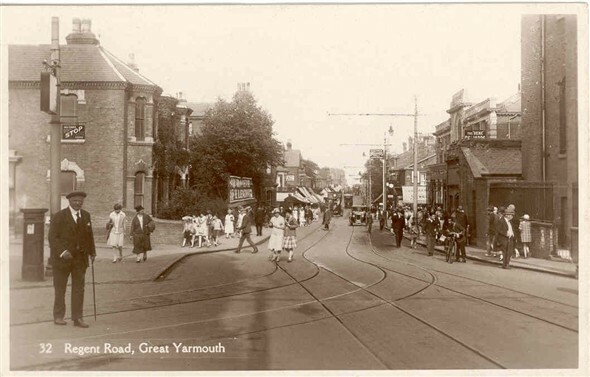 I live in Great Yarmouth and I wish it looked like that now. Going down Regent Road at night is like walking the green mile - not nice. Too much violence and no class. I very rarely go into town now because of this. Which is a shame as I have a lot of family history in this town, my great great grandfather was the mayor of Great Yarmouth for a term and my great grandfather was the founder of a business called Camplings located in Great Yarmouth. Amazing...I am doing some genealogy tracing at the mo and traced my past relatives to 29 Regent Road where they ran a B&B in 1880s so you can imagine my delight with the pictures!! Even if they arent as old as I like...still great! Hi I'm trying to find anything I can about Mayhouse Cottages on Regents Road, trying to trace family tree and my grandfather was born there in 1902? 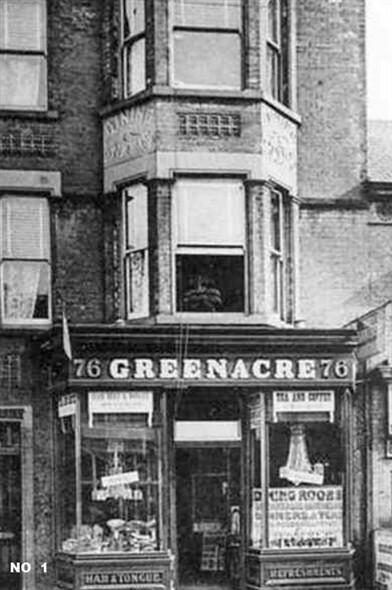 Hi I am tracing my family tree and I am trying to find some pictures of 76 Regent Road when it was a cafe owned by Percy Clements. Would be great if anybody had any memories of the cafe or pictures? Thank you! I am researching my partners family tree and am looking for a Thomas Clifford Anthony and his family, the only information i have is that between 1927 and 1929 he was a watchmaker and had a shop at 12a Regent Road, Great Yarmouth. I would be very greatfull if anyone knows of him or his family and can give me some more infomation. Hi, Any info on the Plowmans of Regent Road would be great. 1880s-1910 onwards. 64, 72, and 73 Regent Road. Confectionery shop and tea rooms and Boarding house. I need to pick your brains please! I'm searching for any info on No.1 Mayhouse Cttage which i believe was on Regent Road. John Fayers was head of family in the 1901 census. Would there be any pictures or maps? Where do i locate them if they exist? I am in Great Yarmouth in July. Thank you so much. re: Jean Drury's enquiry about Mayhouse Cottages. Found them just off Regent Road. No's 1 & 2 have been replaced by modern buildings. No's 3 & 4 are still original. May house cottages are still there, or part of them are. They are just behind Regent, through an alley way between two shops. Don't know what the 2 shops are but the alley way is on the left as you walk towards the sea front about half way up the road. They are old fisherman houses but most of them are owned by Broadland Housing Association and are now flats. Hope this helps.